It’s funny what you remember. My tenure with Krell goes way back, to the demo room I was scared to enter, where an early Krell KSA 150 was matched to a pair of Apogee Stage speakers. Even though I had just purchased a Rotel integrated from the same dealer the “Krell room” seemed like exalted territory. next generation FPB 300, FPB600, KSL preamp, SPB32-X DAC, KRC preamp, the KPS20i cd player and finally the KPS25i cd player would follow. This was money spent with consumer dollars, not reviewer dollars. Thoughout my journey reviewing a wide range of manufacturer’s components, I’ve always rooted for Krell’s success, though I haven’t had much experience with current products since founder Dan D’Agostino moved on to form his own company. 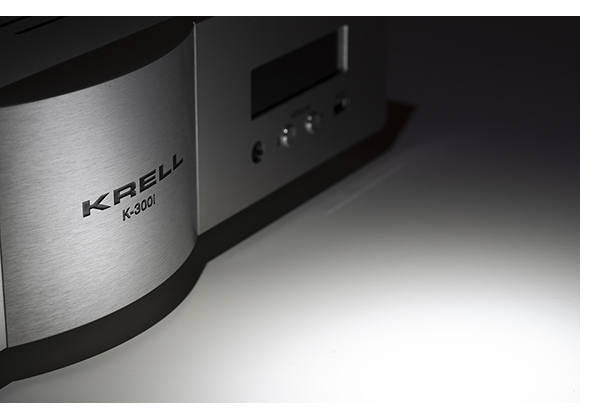 In the middle of evaluating a number of integrated amplifiers, Krell’s Walter Schofield offered the first crack at Krell’s K-300i, making for an excellent opportunity to revisit the brand. Despite a low-profile enclosure, the K-300i weighs in at 52 pounds. Producing 150 watts per channel into 8 ohms, doubling into 4, the K-300i provides the weighty, grip that will entice newcomers, and be familiar to fans. The 1/2-inch milled aluminum front panel (available in silver or black) completes the homage to Krell products past, while the curved front keeps an eye on the future. The K-300i is loaded. Equipped with 2 HDMI inputs, 1 HDMI out and a preamp output to compliment two pairs of balanced XLR inputs and 3 RCA line level inputs, everything at your disposal will easily plug in. Those checking the digital box also have Toslink and coax inputs along with USB and RJ45 ethernet inputs, as well as Bluetooth/aptX capability. This is a well thought out product as a stand-alone control center or integrated into a full home system via the RS-232 ports. Vinyl lovers will need an outboard phono stage, but with so much going on in this compact chassis, I’d almost prefer keeping the delicate analog signal out of this box, and why pay for functionality you don’t need? Digital music lovers are in luck, with Krell offering an internal, streaming DAC for an additional $1,000 over the $7,000 MSRP. This includes an on-board DAC and Roon Ready streamer, that will decode digital files up to 24/192 and unfold MQA as well. Krell’s David Goodman, their director of product development and head of engineering is the person behind the current XD series of amplifiers. 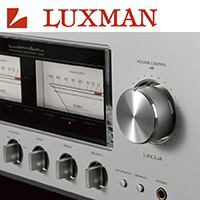 As we saw in a recent comparison, the difference between their last series of amplifiers and those with XD technology, the improvement is not subtle. Fully anticipating big dynamics and a tonal balance favoring the lowest octaves, as with past Krell product, the K-300i is vastly different from past Krell efforts. It’s a top to bottom improvement towards a more refined, yet more musical sound. The lower registers are more refined and controlled at the same time. Retaining the dynamics and forceful low end that’s made Krell famous with audiophiles the world over, the K-300i is more nuanced and natural in its musical delivery. There is a sweetness to the sound that is reminiscent of the original KSA-50. The K-300i is non-fatiguing, inviting you to turn up the volume on your favorite tracks – right out of the box. That’s always a great sign. 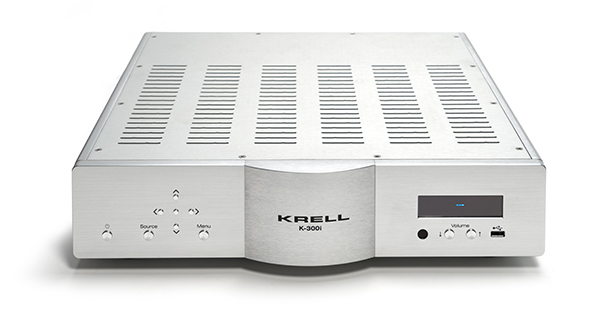 Remember, Krell amplifiers are still class-A, but thanks to Krell’s current i-Bias topology, they don’t run as hot, or draw as much power at low volume levels as the original models did. Yet the K-300i still draws 900 watts from the AC line at full output – and generates a fair amount of heat. Utilizing a wide range of speakers from Sunny Cable, Lansche and PBN, nothing threw the Krell a curve ball it could not field. After a solid week of burn in, some direct comparisons to my reference D’Agostino Momentum Preamplifier and Pass Labs XA200.5 monoblocks, reveals the big bucks gear still having the edge, but it’s not as big as you might think. The key word here is value. This is performance that would have been unheard of ten years ago for this price. This newfound balance altered my approach. Past Krell components always had me reaching for the more bombastic selections in my music collection, but the K-300i sends me to vocal rich recordings, exploring the heart of the mid band and treble in ways that older Krell designs did not inspire as a first move. From Sarah Vaughn’s previously unreleased concert pressed by Devialet, via my VPI Avenger Reference, with the Gryphon Sonett and Boulder 508 phono stages, it’s easy to see what this amplifier does so well. Liquidity, color, expressive dynamics, and space. All positive aspects of these two phono stages, and the differences between them are clearly rendered by the K-300i, revealing the emotion present in the recordings auditioned. Sarah Vaughn’s vocals sound full of life at times and a weary at others. Eva Cassidy’s Live at Blues Alley is another familiar go-to when trying to reproduce inflection, a wide range of dynamic control, and emotional impact. “Bridge Over Troubled Water” from this band is wonderful, and though I’ve heard this recording so many times, the Krell never gets in the way of the music. Just a quick note about the HDMI performance of the K-300i. In a word, it is phenomenal. Watching Mary Queen of Scots, my wife and our friend agreed, it was like we had upgraded our modest Epson projector several levels. Color saturation and detail rendition was startling as was the contrast and brightness. If you are like me and your audio system does double duty as your home theater, the upgrade in video quality alone not to mention the ease of integration is worth at least half the overall cost the K-300i. On balance, this is one of the best sounding pieces of Krell gear I’ve had the pleasure to use. 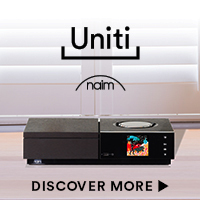 While the last bit of resolution and slam from their top products is not here, because you can’t have everything for $8,000, Krell has made it a point to deliver a high degree of sonic excellence and balance in this compact package. Those needing more power can consider using the K-300i as a control center and adding a more massive Krell power amplifier later. The only part of the K-300i that I didn’t terribly enjoy was the Bluetooth streaming, but this is not my favorite way to listen anyway. Still, it is nice of Krell to offer this, so that when friends drop by and want to share their favorite playlist, connectivity is only a click away. It’s a true treat for this long time Krell user to hear what they’ve achieved with their latest XD technology and the K-300i in particular. At this price, it can make an excellent anchor for a reasonably priced, yet high performance audio system. Its compact form factor makes it an easy roommate to live with as well. 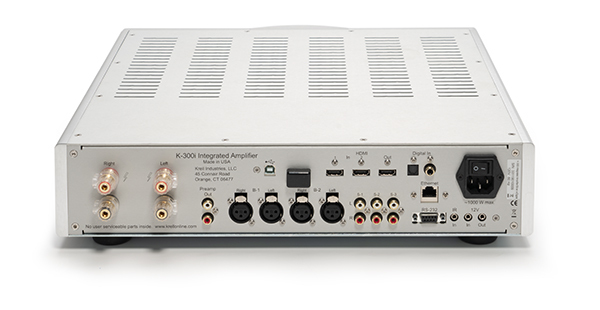 And I still think about that KPS25i – it was one of the coolest pieces of audio gear I’ve ever owned. It’s funny what you remember. The K-300i is a piece that I suspect its owners will treasure for a long time.